Italian painter, printmaker and draughtsman, the last outstanding representative of Italian monumental painting. 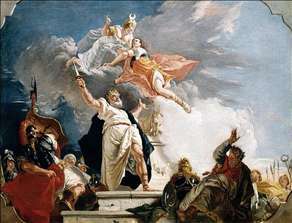 He was one of the most prolific and well-known followers of Sebastiano Ricci, with whom he had his earliest training, and particularly of Giambattista Tiepolo. By the end of the 1720s he had studied in Rome (where he is documented in 1728) and Bologna; the influence of the forthright tenebrism of the Bolognese school is evident in his first independent works, such as the Adoration of the Shepherds (c. 1732; Burano, S Martino). 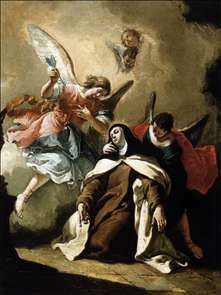 Around 1730 he was in Udine, where he studied Tiepolo s frescoes in the cathedral and in the archbishop s palace, and during the next few years he came into direct contact with Tiepolo, perhaps in Venice. 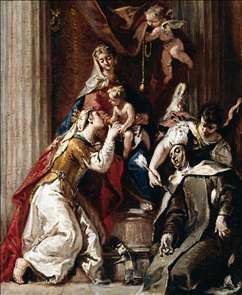 Ricci remained influential, and in 1731 Fontebasso was engraving, in Venice, the altarpiece of St Gregory Interceding for Souls in Purgatory that Ricci had painted for S Alessandro della Croce in Bergamo. Fontebasso s work, however, increasingly emulated that of Tiepolo, with a consequent lightening and freeing of his palette. In Italy he worked with Tiepolo on the decoration of the Palazzo Barbarigo; with Diziani on the decoration of the Palazzo Bernardi (1743-50), and the Palazzo Contarini at S. Benedetto (c. 1748), and on his own at the Palazzo Boldu (1744-45), and the Palazzo Duolo (c. 1743). He worked in Russia in 1760-1762. He is the last outstanding representative of Italian monumental painting. See more details about "The Ecstasy of St Therese"
See more details about "Mystic Marriage of St Catherine with St Therese"